This is plate 38 from William Hodges' book 'Select Views in India'. 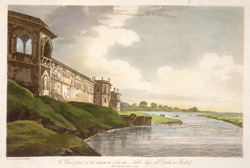 In 1783 Hodges went to Faizabad and saw the abandoned palace of the Nawab of Oudh. Built on the south bank of the Ghaghara River, the palace was constructed by the third Nawab of Oudh, Shuja ud-Daula (1754-75), and was named 'Fort Calcutta'. In 1775 his successor, Asaf ud-Daula, abandoned the palace when he decided to shift the capital of Oudh from Faizabad back to Lucknow.